The Thirty Meter Telescope (TMT) has launched THINK (The Hawaii Island New Knowledge) Fund to better prepare Hawaii Island students to master STEM (Science, Technology, Engineering and Math) and to become the workforce for higher paying science and technology jobs in Hawaii’s 21st century economy. TMT’s founding gift of $1 million marks the beginning of the construction phase of astronomy’s next-generation telescope on Mauna Kea, Hawaii. Grants are available by application to THINK Fund at Hawaii Community Foundation beginning November 20th and will support a variety of Hawaii Island STEM student activities in and after-school, internship programs and teacher-generated STEM classroom projects. Scholarships will support current and future STEM teachers on Hawaii Island as well as students pursuing STEM degrees and training. Scholarship applications will be available online on December 1st, 2014. Advisory Committee members of THINK Fund at the Hawaii Community Foundation are Laurie Ainslie, Roberta Chu, Mary Correa, Kaeo Duarte, Hiapo Perreira, Doug Simons and Barry Taniguchi. The Advisory Committee, facilitated by Hawaii Community Foundation staff, will assist with strategy development, review grant proposals, make grant decisions and encourage STEM education for Hawaii Island. THINK Fund at the Hawaii Community Foundation is open to all Hawaii Island students including Native Hawaiians, teachers with STEM classroom projects and organizations providing STEM and internship programs that directly benefit Hawaii Island. Learn more and apply at www.hawaiicommunityfoundation.org. The Hawaii Island office of Hawaii Community Foundation is located in Waimea. Scholarship Programs will be the initial focus of THINK Fund at the Pauahi Foundation. Grant making is being considered for the future. “With Hawaii Island having the second largest population of Native Hawaiians in the state of Hawaii, our partnership with TMT provides much-needed financial support for Hawaiian learners from Hawaii Island to pursue educational opportunities in STEM,” said Hawaii Island resident and Pauahi Foundation Executive Director Keawe Liu. Advisory committee members of THINK Fund at the Pauahi Foundation are Roberta Chu, Kaeo Duarte, Leinaala Enos, David Kaapu, Bob Lindsey, Gail Makuakane-Lundin and Maile Wong. THINK Fund at the Pauahi Foundation is open to all Hawaii Island students with a preference given to applicants of Hawaiian ancestry to the extent permitted by law. Scholarship applications will be available online on February 4, 2015 at www.pauahi.org. Construction activities in Hawaii include site preparation and grading. Offsite work has begun in earnest as well. In China, partners are designing the telescope’s fully articulated main science steering mirror system and developing the laser guide star system. Japan has produced over sixty special zero thermal-expansion glass mirror blanks for the main mirror and is designing the telescope structure in detail. Fabricating the mirror support system is ongoing in India. The adaptive optics facility is in final design. The enclosure design has been completed and may form part of Canada’s contribution if Canada becomes a full member of TIO. The primary mirror and mirror control system is in final design in California. The Thirty Meter Telescope Project has been developed as a collaboration among Caltech, UC, the Association of Canadian Universities for Research in Astronomy (ACURA), and the national institutes of Japan, China, and India with the goal to design, develop, construct, and operate a thirty-meter class telescope and observatory on Mauna Kea in cooperation with the University of Hawaii (TMT Project). 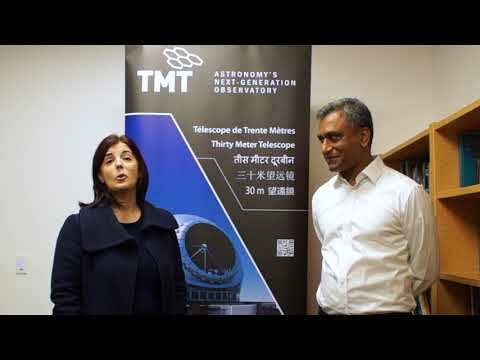 The TMT International Observatory LLC (TIO) was established in May 2014 to carry out the construction and operation phases of the TMT Project. The current Members of TIO are Caltech, UC, the National Institutes of Natural Sciences of Japan, and the National Astronomical Observatories of the Chinese Academy of Sciences; ACURA, the Indian Institute of Astrophysics, and the Association of Universities for Research in Astronomy (AURA) are TIO Associates. Major funding has been provided by the Gordon & Betty Moore Foundation. For more information, visit tmt.org , www.facebook.com/TMTHawaii or follow @TMTHawaii. The Gordon and Betty Moore Foundation believes in bold ideas that create enduring impact in the areas of science, environmental conservation, and patient care. Intel co-founder Gordon and his wife Betty established the foundation to create positive change around the world and at home in the San Francisco Bay Area. Science looks for opportunities to transform–or even create–entire fields by investing in early-stage research, emerging fields, and top research scientists. Environmental conservation efforts promote sustainability, protect critical ecological systems, and align conservation needs with human development. Patient care focuses on eliminating preventable harms and unnecessary healthcare costs through meaningful engagement of patients and their families in a supportive, redesigned healthcare system. Visit us at Moore.org or follow @MooreScientific. With 98 years of community service, the Hawaii Community Foundation (HCF) is the leading philanthropic institution in the state. HCF is a steward of more than 650 funds, including more than 190 scholarship funds, created by donors who desire to transform lives and improve communities. In 2013, $43 million in grants and contracts were distributed statewide, including $4 million in scholarships. HCF also serves as a resource on community issues and trends in the nonprofit sector. For more information, visit www.hawaiicommunityfoundation.org. Established in 2001 by the trustees of Kamehameha Schools as its philanthropic arm, the Pauahi Foundation's efforts center on building community partnerships and creating educational opportunities that transform lives within the Hawaiian community. The Foundation accomplishes its mission by awarding more than 100 donor-funded scholarships and grants annually. For more information, visit www.pauahi.org.